Navigant’s Peter Asmus explains why military microgrids may align with the Trump agenda. President Donald Trump’s preference for traditional energy fuels such as oil and natural gas—as well as large centralized coal plants—is clear. Yet, recent trends point to rapid growth in small, distributed energy resources (DER). These DER technologies range from rooftop solar PV panels to new kinds of batteries and from wind turbines to fuel cells. They become optimized by IT and software into smart networks such as microgrids and virtual power plants. Navigant Research estimates that between 2014 and 2023, different forms of distributed generation (DG) will displace the need for more than 320 GW of new large-scale power plants globally. New DG capacity additions are expected to exceed new centralized generation capacity additions by as early as 2018. Nearly $2 billion is forecast to flow into the global market for DER over the next 10 years. Despite what might seem to be a collision course between shifting US energy priorities and technology trends, there is a market where DER and other Trump priorities align: military microgrids. Don’t forget Trump is also focused on bolstering the US military as part of a strategy to address the threat of terrorism, so funding levels for the federal Department of Defense (DOD) may increase. Interestingly enough, the nation’s new Secretary of Defense James Mattis has revealed that he is a big fan of microgrids, particularly those that integrate solar PV. Mattis’ point of reference is combat conditions, where high mortality revolved around supplying fossil fuels to combat missions in Iraq and Afghanistan. Also a factor is the value of reducing necessary fuel transport for forward operating bases and portable tactical microgrids. 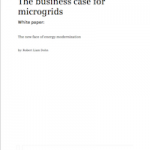 These perspectives could help revive a microgrid segment that has been lagging lately. The combination of tight federal DOD budgets, complicated and bureaucratic procurement protocols, and a market closed to many microgrid innovators all combined to stain what was once seen as one of the best opportunities for microgrid development in the United States. As a result, many leading microgrid vendors that focused on the military segment 5 or 6 years ago turned their sights elsewhere, frustrated by the slow pace of development, complex contracting challenges, and the failure to integrate renewable energy purchasing with onsite base resilience priorities. A study released earlier this month by Pew Charitable Trusts claimed that the US military could save $1 billion through the incorporation of microgrids, shifting away from a reliance on standby diesel generators. A good portion of these savings are based on increased efficiency through the better system management possible with a microgrid. Substituting natural gas for diesel and incorporation of solar PV are also part of the savings equation. Look for a renewed push on military microgrids over the next four years, both in the United States and abroad. Peter Asmus is associate director of energy at Navigant Research.